They're known as the 'Giant's Table and Chair', two 100-foot sea stacks punching up from the ocean beneath the Slieve League cliffs. The Donegal Bay stacks can be seen from the road-end viewpoint at Bunglass, but that's as far as most people get - most people, but not Iain Miller. 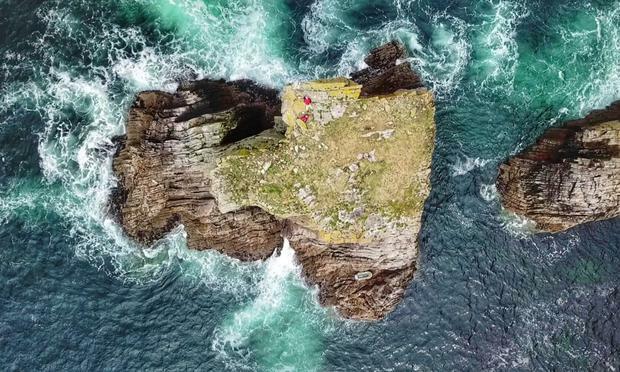 Miller, who runs Donegal-based climbing and adventure operator Unique Ascent (uniqueascent.ie), has undertaken several of Ireland's most epic climbs in recent years, including a daredevil ascent of Mayo's Dún Briste sea stack - the first in over 25 years. Most recently, he climbed down towards the storm beach at Slieve League, paddled out to the stacks in an inflatable dinghy, and summited The Table. "I have made a couple of attempts at this stack over the last two years, but this time Neptune was kind," Miller told Independent.ie Travel. "It is an indescribable experience standing on the summit of a rarely, if ever, visited sea stack. The Giant's Table stack shrinks as you climb to its summit and once you are standing there surrounded by the colossal south face of Slieve League, you feel very small indeed." NB: Climbing can be an extremely dangerous activity and should never be undertaken without suitable expertise, equipment and guides. The climber featured in this video is a professional - do not attempt to replicated his climb. Responsible walkers always respect private property. Six secret spots in New York - how many have you seen? You've seen the big sights in New York, but what about the hidden gems? "There is a bond," says Jeannine Masset.